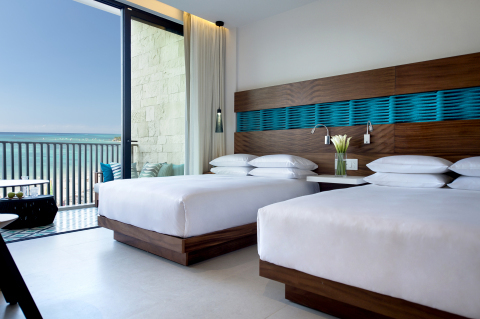 CHICAGO--(BUSINESS WIRE)-- Hyatt Hotels Corporation (NYSE: H) today announced the opening of Grand Hyatt Playa del Carmen Resort, in Playa del Carmen, Quintana Roo, Mexico. Situated in the heart of one of the world’s most desirable beach towns, its oceanside setting in the Riviera Maya is remarkable. The hotel becomes the first Grand Hyatt branded hotel in Mexico, as well as the eleventh Hyatt-branded hotel in the country. Stretched along the sparkling turquoise waters of the Caribbean Sea, the iconic resort is situated just steps from the pristine white sands of the renowned Mamitas Beach and the vibrant shops, restaurants and nightclubs of Playa’s legendary Fifth Avenue. The distinctive resort seamlessly blends modern, contemporary design elements with Mayan-inspired textures and materials. Designed by the world-renowned Sordo Madaleno architecture group, the hotel’s striking, open-air architecture reflects the local culture while incorporating natural elements throughout, including a cenote-inspired spa and the preservation of a section of sacred mangrove jungle on property to serve as a natural wildlife sanctuary. The sophisticated retreat is comprised of 314 spacious guestrooms, including 36 suites, 20 oceanfront “air suites” and two presidential suites. A selection of lavish swim-up suites afford guests direct access to one of the resort’s stylish infinity pools overlooking the beach. Earth hues, and natural textures and tones are found in smooth gray stone, intricate water features and rich woods throughout the resort, designed to mirror the region’s landscape. Floor-to-ceiling windows and expansive terraces offer breathtaking views of the ocean from every vantage point. Room features include double-sink bathrooms, dedicated vanity areas and three-headed showers, among other enhanced additions. Grand Hyatt Playa del Carmen Resort features two on-site restaurants, each with an impressive show kitchen: La Cocina offers authentic, family-style Mexican and Caribbean fare, while the resort’s signature ocean view restaurant, The Grill at 1-26 features a diverse selection of fresh seafood and prime steaks. Chef Nadine Waechter Moreno, a Switzerland native and renowned chef for several award-winning properties, including Park Hyatt Tokyo, is at the helm of the resort’s culinary program, where she has created inspired regional cuisine rooted in indigenous flavors and ingredients. With an emphasis on healthy eating throughout her menus, Chef Moreno showcases innovative, globally-inspired dishes incorporating fresh, seasonal produce sourced from local farms. The Paseo, an interactive culinary experience integrated with the sensational lobby and pathway that leads guests to the pool and beach, showcases an inventive way to indulge in a variety of culturally-influenced menu items and diverse snack options. The resort also features an assortment of bars and lounges including a dessert bar, juice bar, and traditional bars with signature cocktails featuring top shelf spirits and fresh-squeezed juices. An extraordinary feature of the experience at Grand Hyatt Playa del Carmen Resort, the 6,000 square-foot Cenote Spa captures the serenity, rejuvenation and beauty of the region’s cenotes through its unique design and cultural offerings. Iconic geological features known for their deep blue crystalline appearance, cenotes are freshwater sinkholes sacred to the Mayans as they were believed to purify and cleanse the soul with restorative healing properties. The impressive spa design brings a modern interpretation of these local landmarks through intricate stonework detail, dramatic lighting and soothing textures. With eight treatment rooms and specialty facilities, including hydrotherapy stations, a eucalyptus steam room, and fiber optic chromotherapy showers, Cenote Spa offers an array of indulgent services and signature treatments inspired by the season. The Cenote relaxing area is a haven for meditation and rejuvenation. Spa guests can also take advantage of the fitness center with Technogym equipment and a workout studio featuring yoga, pilates, Crossfit and meditation classes. Adorned with eight sensational pools, including three infinity pools that blend effortlessly with the striking blue horizon, Grand Hyatt Playa del Carmen Resort is a premier tropical sanctuary. The resort boasts an assortment of refined worldly experiences, including a curated music microenvironment led by world-class DJ Jared Dietch, which connects guests with the local culture in an emotional and meaningful way. To engage the hotel’s youngest guests, Camp Hyatt at Grand Hyatt Playa del Carmen Resort provides games, crafts and educational activities, including discovery walks, balloon decorating, water volleyball and wildlife shows for children three through twelve years old. For older kids, the resort boasts an impressive state-of-the-art #Hashtag teen arcade complete with table tennis, foosball, a 10-person cinema and video games. Meeting rooms and breakout areas featuring state-of-the-art technology are able to accommodate groups of all sizes for productive meeting experiences. The resort offers more than 15,000 square feet of flexible indoor and outdoor event space, a grand ballroom with soaring 20-foot ceilings and 18 versatile meeting rooms, 17 of which offer natural light. The resort’s business center includes workspaces and extra laptops at reception for guests to use. The Grand Hyatt Playa del Carmen Resort team assists with every step of the planning process for meetings, corporate retreats, weddings and other social events and helps groups choose from different room plans, setups and creative catering options for opulent gatherings. For more information or to make a reservation, visit: playadelcarmen.grand.hyatt.com. Located in the vibrant city of Playa del Carmen, Mexico, Grand Hyatt Playa del Carmen Resort is a luxury oasis that caters to business and leisure travelers alike. The 314-room, Sordo Madaleno-designed hotel features two restaurants, several bars, a full-service Cenote Spa, complete fitness center, and more than 15,000 square feet of flexible event space for meetings and groups. For more information, please visit playadelcarmen.grand.hyatt.com.